Snap or cut the ends off the vegetables and arrange four to six vegetables side by side on a work surface. 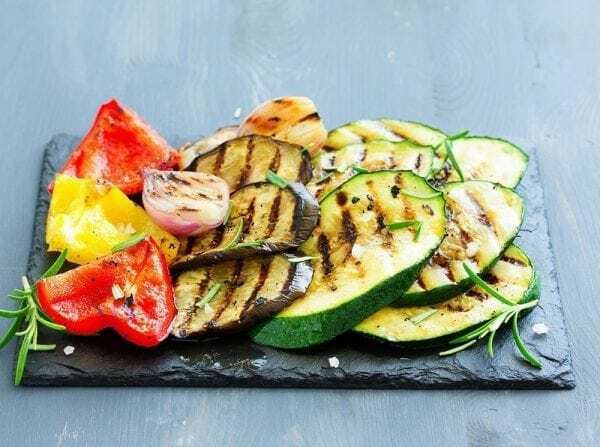 Skewer the vegetables crosswise with slender bamboo skewers, then brush them with olive or sesame oil and sprinkle them with salt and pepper. Cut onions in quarters, but leave the root intact on each piece. Peel the skin back to the root end (the root holds the onion together as it grills) and brush the onion quarters with oil or melted butter. Grill onions over a high flame until they are nicely charred on the outside and cooked through, turning them to ensure even cooking. You'll need 10 to 12 minutes in all. Cut the root off the onions and scrape away the burnt skin before serving. You can also grill onion slices. Cut the squash lengthwise into 1/4 or 1/2-inch thick slices. Brush each side with olive or walnut oil. Season the squash with salt and pepper and grill over high heat. It will be done after 4 to 6 minutes per side.